STAT is one of the top concerns in radiology transcription. The delay in radiology reports is primarily blamed for bottlenecks in patient care. This coupled with other factors such as malfunctioning software or transcriptionists on leave can contribute to the loss of thousands of dollars every year. If this is you, there is a way out - outsourcing radiology transcription services. A winning choice is to collaborate with seasoned radiology medical transcription provider like Outsource2india. Our company is housed with backup resources and cutting-edge software to streamline document collection and customize the turnaround time as per your needs, so you can provide superior patient care. We leverage advanced digital dictation and transcription software to turn digital recordings into high-precision reports in 15+ formats of your choice. All that within 12-24 hours. 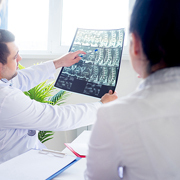 Why Choose Radiology Transcription Services from Outsource2india? Outsource2india is a reputed provider of Radiology transcription services in India and overseas. We are backed by 20 years of experience in an array of medical transcription services. Our specialization in radiology transcription is widely accepted thanks to our ability to focus on minute details of radiology reports. We provide customized transcription that customized for your requirements to save your time and money in a big way. With a team of 100+ certified medical transcriptionists (CMT), we provide the unmatched client experiences worthy of mention. We also provide other similar services such as Dermatology Transcription, Medical Report Transcription, neurology transcription, HL7 Transcription and more. Reach us now if you have requirements related to Radiology transcription so we can help you with customized solutions.